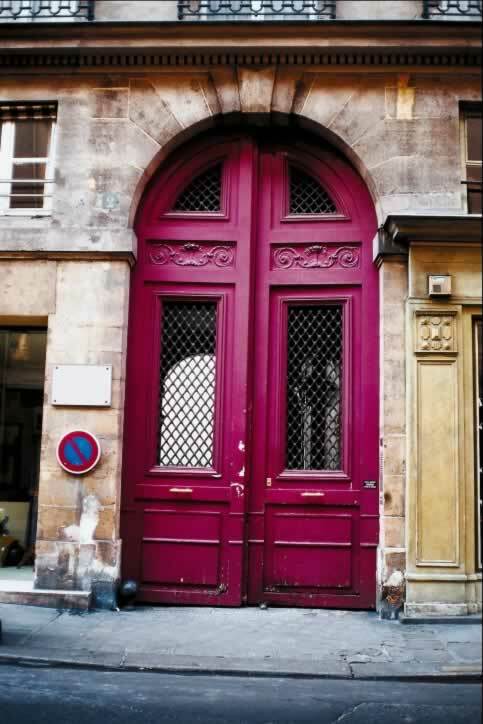 The contrast of these magenta doors is startling, compared to the light brown stone archway into which these doors are set. The enormous double exterior doors form a rounded, or true, arch. Each door is composed of four panels. Two of the four panels are lites (the architectural terms for windows set into doors) with clear glass. Oftentimes doors will have frosted or textured glass to provide more security or privacy. The security, in this case, is taken care of with metal grilles placed over the glass. The top, wedged-shaped panel is a lite. Beneath it is a small, horizontal panel with swirling carvings. Next is the second lite, also the door's biggest panel. The rail between this and the bottom most panel promotes the door's only hardware, a small chrome push bar to help visitors push open these massive doors.